I thought today, as we are currently in spring (apparently! ), it would be good to look at some of the benefits of one of the delicious seasonal vegetables that will be available in the next few months. The Asparagus plant has spear like shoots with a tight bud at the top. It is normally green or purple in colour, but can also be found in white, which has been grown underground to gain a more delicate flavour. Asparagus is best eaten when the shots are young as the stems are tender and less woody. Asparagus is a great source of fibre and for a vegetable is relatively rich in protein. Eating asparagus will supply you with a wide range of vitamins including; C, A, K and many of the B vitamins, especially B6. It is also a great source of potassium. 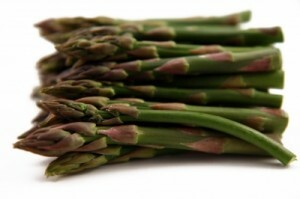 With regards to further health benefits, asparagus is well noted for its diuretic effects. As a side note, it is quite common, in over 50% of the population for there to be a distinct odour to urine almost immediately asparagus has been consumed. This strong sulphuric like smell is nothing to be alarmed by, but is associated with the broken down protein (amino acid) asparagine. Consuming asparagus has also been shown to benefit suffered of arthritis, as its antioxidants may help to reduce inflammation. Asparagus can be eaten raw if very young and tender, or it can be used in stir-frys, or my favourite simply steamed for a few minutes until tender, then served immediately with some black pepper, garlic and olive oil. Once steamed spears can also be plunged into cold water to cool, then served in a salad. Now we are heading towards spring, let’s begin focusing on the beautiful B’s. There are quite a few varieties of fruit and veg in this category, so I will have to spread them over a couple of weeks in order to enjoy them all. There are even a couple that I have not used in cooking before, so we will have to be a little adventurous together. However, I would like to kick off with one of my family’s all time favourite, one of the beloved brassica’s, it is broccoli! A member of the brassica family, broccoli is also known as a cruciferous vegetable. This complex carbohydrate is a very good source of dietary fibre, vitamins and phytochemicals and is often referred to as a superfood. Broccoli is an excellent source of folate and vitamins A,C and K. It is also a great source of potassium, magnesium, calcium and B6. This Brassica vegetable is also rich in the anti oxidant sulforaphane which is believed to help protect against certain forms of cancer. And another valuable phytonutrient contained within this gem is Indole-3-carbinol, which is also an important cancer-fighting compound. Broccoli can lose more than 60% of its vitamin C, but only 20% when steamed. Stir-frying is also a good cooking method as the food is cooked very briefly, allowing it to retain most of its nutrients. You can also pop a head of broccoli in a food processor and blitz it for a few seconds to create tiny pieces and then sauté for a few minutes with herbs, garlic and spices for a lovely broccoli rice. You can also use it to make a delicious soup, in fact it even makes me think of Christmas, when using up some Stilton cheese! And also look out for broccoli sprouts (about the same size as cress) which are delicious in salads. The small dark blue or purpled skinned blueberry is a member of the Ericacae family, as is the bilberry (which I am finding incredibly hard to get hold of, so I will have to go a foraging later in the year!) These sweet berries vary in size depending on the variety, and have a pale, clear flesh encasing tiny seeds. Blueberries are an excellent source of Vitamin C and fibre both soluble and insoluble. 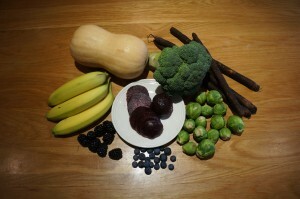 Also the blue/purple pigmentation of the skin offers fantastic sources of antioxidant flavonoids such as anthocyanidins. These special compounds are thought to help protect the brain from oxidative stress, which in turn may help protect against Alzheimer’s disease. There is also quite a lot of research into the positive effects that bilberries and blueberries may have on preventing age-related macular degeneration, such as cataracts and glaucoma. Blueberries are now available year round as you can get them frozen or imported from another country, but the British blueberry season is from about July to September. In the garden, I have a small blueberry plant in a pot, which gives my youngest daughter an immense amount of pleasure waiting for them to ripen. Blueberries are delicious to eat as a snack, or add them to porridge or cereal in the morning. You could also throw some in some natural yoghurt or coconut yoghurt and sprinkle with seeds and nuts for a lovely breakfast or dessert. Blueberry buckwheat pancakes are a really delicious breakfast treat at the weekend as well, when you have a little more time to linger in the kitchen! Beetroot is part of the same genus as chard and spinach. We can also separate these beets into 2 independent vegetables as well if we want. The green, leafy part that grows above grown known as beetroot chard (we will look at that another day) and the part we will focus on today the bulbous root. Primarily, the beetroot is known for its deep purple colouring, however, recently from Abel and Cole I got some gorgeous golden beetroot through. Beetroots are an excellent source of folic acid and also add fibre, potassium and manganese to our diet. The purple pigmentation of the beetroot holds a powerful antioxidant called betacyanin, which is believed to act as cancer fighting agent against some forms of cancer. Beetroot are have quite a high natural sugar content, which in turn give them a sweet earthy flavour. They are delicious eaten raw, and when grated can make a colourful and nutritious addition to salads. Beetroots are also fantastic to add into juices as they offer nutritional content along with a beautiful colour. However, you do not need much so just add half a small beetroot or a big wedge of a large one. Roasted beetroot is a great accompaniment to roast meats and fish when roasted alongside some other root veg or squashes. Also why not try using them in a soup like the eastern Europeans do in Borscht. You can also bake or boil beetroot until tender and then use it cold in salads or throw into a chocolate cake for a deliciously rich treat. Check out my recipe for my healthier Beetroot Chocolate muffins in the recipe section. Well, up until Sunday, I thought I had fully covered the A’s and moved unto the vast quantity of B’s. I’m sure though, a few of you may well have thought that I had missed out Artichoke, but hold fire, as these beauties are to be listed under their different varieties later in the game! However, on reading the paper over my anniversary breakfast on Sunday (11 years by the way), I discovered Agretti, something I and most of the population had not heard of! Agretti is like a land seaweed and tastes a bit like samphire apparently. Although, it does not look like I will be trying it anytime soon, as British sources have all been snapped up and I can’t even grow it myself as seeds have also sold out and are now on pre-order for 2016. This high demand is due to celebrity chefs such as Jamie Oliver using it and bringing it to our attention. It is difficult to find out the exact nutritional benefits of this new wonder vegetable as of yet, but it looks a little like chives and is seasonal in Spring, so if you see some buy it and give it a go. If you don’t like it, you can always auction it off to the highest celebrity chef bid, check out attached article! Place the couscous in a large bowl, add boiling water or stock and season. Cover with a clean tea towel and leave for 5 minutes, then fluff up with a fork. Set aside to cool. Finely dice the beetroot and tomato then stir into the couscous along with any juices. Whisk together the oil and lemon juice, season with salt, pepper and chives and then stir through into the couscous. Leave to stand for a few minutes to infuse, and then top with crumbled goats cheese. Cook the beetroot in boiling water until tender. Approx 1 -1.5 hours depending on size. Then cool and peel off skin with fingers. Melt the chocolate in a heatproof bowl over boiling water and then set aside. In a food processor blend the beetroot into a puree then, slowly add eggs, followed by coconut oil, vanilla and the melted chocolate. In a large bowl sieve flour, cocoa powder and baking powder together then stir in ground almonds and coconut sugar. Make a well in the middle then blend in the wet ingredients with a spoon. Spoon into muffin cases and bake for 25-30 minutes. In a large saucepan bring water to boil, add pre soaked beans and boil rapidly for 10 minutes. Add all other ingredients except for basil, season with black pepper and cook for a further 30 minutes. Remove from heat and tear basil leaves and sprinkle for serving. Serve with wholemeal or rye bread for lunch or dinner. Well as we are in the 1st month of a new year I thought I would begin with my mission to get the nation eating more fruit and vegetables. 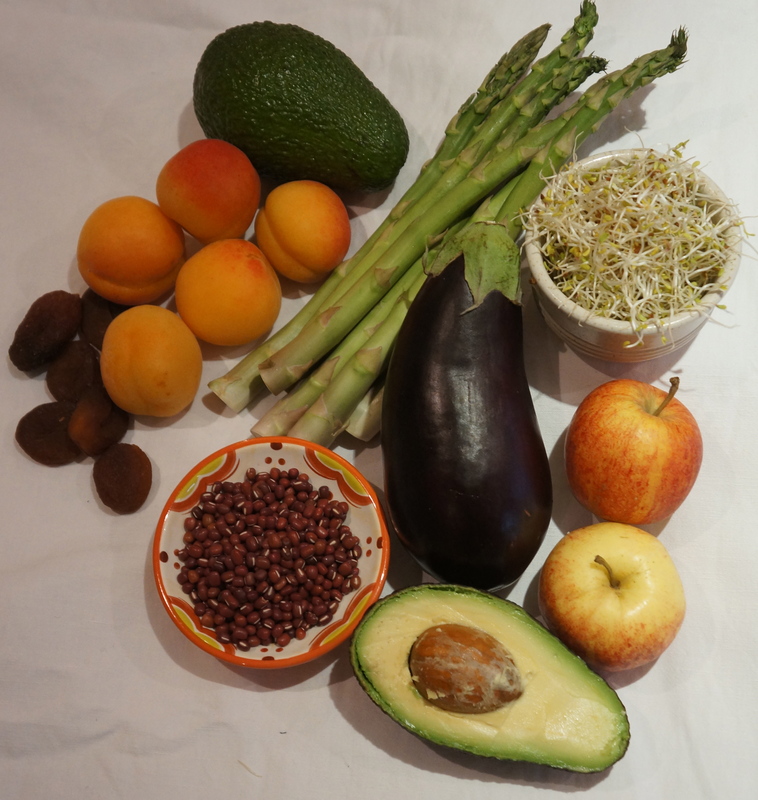 Last year, when I was very new to blogging and trying to establish myself in the workplace as a nutritional and wellbeing expert, I endeavoured to start the A-Z of fruit and vegetables. But, as you can see from my lack of posts throughout the year I did not get very far at all. (A slight understatement, me thinks!) So lets begin again with all the delicious A’s out there. I have already covered Avocado’s and Asparagus, but there are still a few more. Alfalfa sprouts: Alfalfa technically belong to the legume section of fruit and veg as they are a member of the pea family. Alfalfa are tiny little white stalks that grow out of a tiny reddish brown seed, with a sweet green sprout/shoot on the top. Alfalfa sprouts are a great source of phytoestrogens, which can be very beneficial in balancing hormones that may be disrupted by the menstrual cycle or menopause. Alfalfa are also a good source of Vitamin C, which can help support the immune system. In addition to this, they are also a source of saponins, a group of phytochemicals which are shown to help positively widen the ratio between the LDL (bad) cholesterol and HDL (good ) cholesterol within the body. For a tiny little being, these sure do pack some punch! It is also really easy to eat too with quite a mild sweet flavour. Add alfalfa to salads, sandwiches, burgers and it is also delicious combined with another of our A’s, Avocado’s! Just sprinkle some on top of some sliced avocado and a good grind of black pepper, serve with hummus and crackers/oatcakes. Yummy! Time for another legume now, a small reddish brown nutty flavoured bean; the Aduki or Adzuki Bean. As with most legumes these beans are a good source of protein and dietary fibre, but they are also one of the easier to digest. Used frequently in Asian cooking, these beans are a good source of B vitamins and Potassium and also rich in trace minerals zinc, copper and manganese. These beans can be used in curries, soups, salads and are often used sweetened in desserts. There are lots of fantastic recipes on the internet, so have an explore and try out something new. You can buys these beans pre-cooked in tins or dried. If you buy the dry variety, as with all legumes ensure you soak overnight for 12 hours prior to following the cooking instructions on the packet or recipe. Add aduki bean soup recipe. Aubergine: Although we think of Aubergines as vegetables, they are technically fruit, a berry in fact, but let’s not be pedantic! The aubergine belongs to the nightshade family, along with potatoes and tomatoes. The most commonly used aubergine is a purple bulbous egg shaped fruit that is also known by the name eggplant. There are many different varieties of the aubergine, varying in colour and size. Aubergine is an excellent source of fibre, vitamins B1 and B6 and also potassium. In addition it is high in the minerals copper, magnesium and manganese. Contained within the skin of the aubergine, there are flavonoids and phytochemicals that act as powerful antioxidants and may help to lower cholesterol. Aubergines are incredibly versatile and can be cooked in many ways, including steaming, stir-frying, grilling and baking. The flesh of the aubergine can often appear bitter and it is recommended sometimes to sprinkle the cut fruit with salt prior to cooking for 30 minutes. However, if you are trying to reduce your sodium intake, this is not completely necessary, or alternatively rinse the slices again prior to cooking. Some popular dishes to try are; ratatouille, see recipe; moussaka, which is a great way to enjoy a grain and gluten free dish and why not try using roasted aubergine in a dip. Apple: ‘An apple a day keeps the doctor away’ – hardly surprising when we look at the fantastic nutrients contained within this delicious fruit. The apple is a member of the rose family, and comes in a variety of colours tastes and textures. Contained within either red, green or yellow skin, the white flesh of the fruit can be sweet, mild, crisp or tart. Most apples can be eaten raw, although certain varieties benefit and respond well to cooking. Apples are an excellent source of dietary fibre (especially pectin, a soluble fibre, which helps maintain healthy bowel function). In addition apples are a great source of vitamin C and potassium. There skins are also abundant with phytochemicals such as quercetin and ellagic acid, a powerful antioxidant. So therefore for maximum nutrient punch, where possible aim to eat organic, washed raw apples with their skin on. Apples are an ideal snack, portable, readily available and deliciously sweet. In order to balance out the natural sugars found within these gems try adding a small handful of unsalted nuts such as pecans, brazil of walnuts to maintain optimum energy and blood sugar levels. Apricots: A small, round, fleshy, golden orange single stoned fruit, belonging to the same family as cherries, plums and peaches. These fruits can be eaten raw, cooked or dried. Apricots are a good source of potassium and iron. They are also rich in carotenes, lycopene and lutein, the phytonutrients which give fruit and vegetables the orange and yellow colours. These nutrients are shown in many studies to possibly help prevent heart disease and cancer. Eat these fruits whole and raw as a snack, or slice them onto hot or cold breakfast cereals for added sweetness. Apricots are also delicious cut in half and baked with a sprinkle of ground almonds and honey, for a sweet dessert. Dried apricots are excellent to use in baking and can often be used to substitute the sweetness of added sugar. They are also delicious chopped up in rice, cous cous or added to stews. You might think I have left out Asparagus and Avocado, but check them out in my historical posts! The Avocado is my food of choice today. Fruit or vegetable some may wonder, since it lacks the sweetness of other fruits. However with its creamy smooth texture, and large stone in the middle, it definitely is a fruit, although not usually eaten as a dessert. 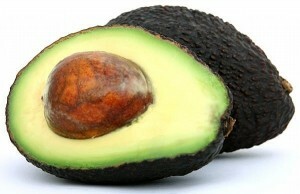 The avocado is a good source of fat, and contrary to popular believe we do need fat in our diets. It’s just a matter of choosing the right sources of fats, rather than opting for low fat or no-fat diets. Without fat in our diet we would miss out on all the valuable fat-soluble vitamins and nutrients, such as vitamins A, D and E.
In order to find a perfectly ripe avocado should yield to gentle pressure when held in the palm of the hand and squeezed. Avocados make a fantastic addition to any salad or sandwich. They are delicious scooped out and filled with prawns; or mashed up and used as a base for Guacamole; but my favourite way is to have them simply thinly sliced on top of a slice of fresh seeded wholemeal bread or toast with fresh black pepper and a squeeze of lemon juice. Every week on a Friday I get my food delivery from Abel and Cole. I order delicious organic meat, poultry and fish, but my favourite part each week is the surprises that are in my organic fruit and vegetable box. I thought that I was pretty adventurous with my eating, but sometimes items arrive that I have never seen or heard of before. If I am ever stuck with how to cook, or prepare anything in my box, Abel and Cole also provide an extensive recipe list online where you can just search under the ingredients that you have. Another thing I love about Abel and Cole is that they tell you where your food comes from, who farmed it and a little bit about their lives. It makes food seem somehow more personal and more precious to me, which in turn I think makes it a little more enjoyable. Last night I watched the film ‘The Perfect Human Diet’. It is a very low budget documentary investigating eating patterns of the human race in relation to modern day health issues. The film, although not particularly well executed at points, covers in depth an incredibly important topic – the invention of the modern day diet and its implications on the evolving human. I felt the film would have benefited from a more balanced argument in relation to alternative diets, rather than being so heavily centered on the side of the Paleo diet. This inclusion of debate may well have created more impact with its message, as it induces internal discussion within the viewer. However, in saying all this, the film certainly makes me question some of my current dietary inclusions and has made me more curious into aspects of the Paleo diet, which I look forward to investigating. I will keep you posted with my findings so watch this space ….. Eating healthily does not need to break the bank. It is possible to do, even on the smallest of budgets. However, it does take a little forethought, a bit of shopping around and a small amount of time invested in cooking. So many of us now lead such hectic lifestyles, juggling careers, family life and socialising, that necessary tasks such as shopping for food each month are often done via the internet, or in one of the major supermarkets, which conveniently offer everything we need under one roof. Unfortunately though we will not always get the best deals on offer if we always shop in the same store. When looking for fresh produce such as fruit and vegetables you often get the best offers from local markets, and I would always advice people on a tight budget to find a market local to them. It could be a weekend market close to home, or a daily market on the way to work. Either way, it’s always good to find out when the market closes, because at the end of the day, you can often get some amazing bargains. One Saturday afternoon walking passed a market close to a friend’s house, I spent the total of £3, and walked away with a carrier bag full of peppers, one full of aubergines and two bags filled with courgettes. Of course, there were far too many vegetables for my family and I to enjoy fresh, but Sunday morning was spent cooking a very large batch of Ratatouille that could then be refrigerated or frozen, and used in so many different ways. Ratatouille is packed with Vitamin C and the anti-oxidant Lycopene, and it is also an incredibly versatile and nutritious dish. It makes a delicious and colourful accompaniment to fish, meat or chicken, and it can also be served topped with cheese, as a dish on its own with wholegrain rice or jacket potato. For children the dish can also be puréed to make the vegetables a little more hidden, so that it can then be used as a delicious sauce for wholemeal pasta or even put on a pizza base to create your own nutritious pizza. At home we also use it on top of some leftover mashed potato, then top it with cheese and sometimes ham or tuna to make lovely pizza potato. Be adventurous, be inspirational and be healthy. Check out my basic recipe for Ratatouille for 4. Remember you can always multiply the amounts to make a bigger batch! In a saucepan gently heat the oil and then add onion and garlic, lightly sauté for 3-4 minutes until softened. Add chopped pepper, courgette and aubergine and stir well to coat with oil, sauté for a further 5 minutes. Add tomato puree and tomatoes, season with black pepper and oregano and simmer gently for 25-30 minutes.